The global fire protection systems market is projected to grow at a healthy pace in the coming few years. The strong growth of this market can be attributed to the rising trend of using water mist systems and the increasing use of the Internet of Things and Big Data. As per the market study by Transparency Market Research, in 2014, the global market for fire protection system stood at US$5.08 bn and is projected to reach a value of US$8.93 bn by the end of 2023. The market is estimated to register a healthy 6.48% CAGR between 2015 and 2023. The high rate of modernization and technological developments in the construction sector are the major factors that are anticipated to enhance the overall development of the fire protection systems market in the next few years. A significant rise in the number of deaths and the increasing cases of property loss owing to fire breakouts are estimated to ensure the overall development of the market in the coming few years. In addition to this, the strict government rules and regulations and high development in the wireless technologies for the fire detection systems are further anticipated to support the growth of the overall market in the next few years. 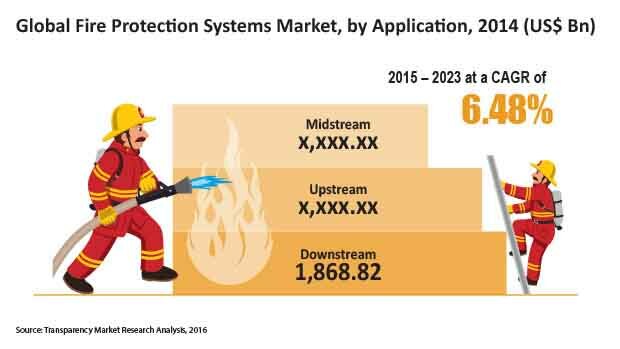 The global market for fire protection systems is projected to face a few challenges, which may further result in a slight downfall of the growth in the near future. The high cost of maintenance and high cost of installations of fire protection systems are predicted to restrict the market growth in the near future. Moreover, the unexpected failure of the fire alarm systems is estimated to further curtail the development of the overall market in the coming years. The global market for fire protection systems has been classified on the basis of geography into Latin America, Asia Pacific, North America, Europe, and the Middle East and Africa. The fire protection systems market across North America is anticipated to account for a large share of the market and will continue its dominance over the next few years. The tremendously rising investments in the oil and gas industry and the growing demand from Canada and the U.S. are projected to support the development of this region in the near future. The Asia Pacific market for fire protection systems is anticipated to grow at a healthy pace in the next few years, thanks to the rising number of exploration activities. Fike Corporation, Consilium AB Publ., Gielle Srl, 3M, S, Emerson Electric Co., Danfoss Semco A/S, Johnson Controls plc, Drägerwerk AG & Co. KGaA, KEVTA Fire Systems, Inc., Blaze Manufacturing Solutions Ltd., Deluge Offshore & Marine Pte Ltd., and Honeywell International, Inc. This research study analyzes the market for fire protection systems in terms of revenue (US$ Mn). The fire protection systems market has been segmented on the basis of oil & gas operational sectors and regions. In terms of region, the market has been further divided into five segments. For the research, 2014 has been taken as the base year, while all forecasts have been given for the period from 2015 to 2023. Market data for all the segments has been provided at the regional level from 2014 to 2023. The report provides a broad competitive analysis of companies engaged in the fire protection systems business. The report also includes the key market dynamics such as drivers, restraints, and opportunities affecting the Global Fire Protection Systems (for Oil and Gas) market. These market dynamics were analyzed in detail and are illustrated in the report with the help of supporting graphs and tables. The report also provides a comprehensive analysis of the Global Fire Protection Systems (for Oil and Gas) market with the help of Porter’s Five Forces model. This analysis helps in understanding the five major forces that affect the market structure and market profitability. The forces analyzed are bargaining power of buyers, bargaining power of suppliers, threat of new entrants, threat of substitutes, and degree of competition. The high-level analysis in the report provides detailed insights into the fire protection systems business globally. There are currently numerous drivers of the market. One of the most prominent drivers is the stringent safety regulations by government institutions for the installation of fire protection systems. Market attractiveness analysis was carried out for the fire protection systems market on the basis of regions. Market attractiveness was estimated on the basis of common parameters that directly impact the market in different regions. The fire protection systems market was segmented on the basis of oil & gas operational sectors (upstream, midstream, and downstream). These operational sectors are further divided into onshore and offshore applications for fire protection systems. The onshore upstream operational sector comprises onshore drilling rigs, whereas offshore upstream operational sector includes offshore platforms, drill ships, and offshore oil rigs. The onshore midstream operational sector includes accommodation areas and pipelines, while offshore midstream operational sector includes FPSO, LNG carriers, and offshore support and supply vessels. The downstream operational sector has been sub-segmented into four applications: production vessels, production platforms, refineries, and petrochemicals. The fire protection systems market was analyzed across five geographies: North America, Europe, Middle East and Africa, Asia Pacific, and South and Central America. Regional data has been provided for each sub-segment of the fire protection systems market. Key players in the fire protection systems market include 3M, Blaze Manufacturing Solutions Ltd., Consilium AB Publ., Danfoss Semco A/S, Deluge Offshore & Marine Pte Ltd., Drägerwerk AG & Co. KGaA, Emerson Electric Co. (Net Safety Monitoring Inc., Spectrex Inc.), Fike Corporation, Fire Protection Engineering A/S, Gielle Srl, Honeywell International, Inc., Johnson Controls plc, KEVTA Fire Systems, Inc., Knowsley SK Limited, Minimax GmbH & Co. KG, MSA Safety Incorporated, Orcus Fire & Risk, Inc., Semco Maritime A/S, Siemens AG, SK Fire Safety Group B.V., Trelleborg AB, Tyco International Ltd. (Oldham SAS, Water Mist Engineering AS), Ultra Fog AB, Unisafe Fire Protection Specialists LLC, United Technologies Corporation (Autronica Fire & Security A/S, Detector Electronics Corporation (Det-Tronics), Marioff Corporation Oy), and Wilhelmsen Ships Service. The report provides an overview of these companies, followed by their financial details, business strategies, and recent developments.